Stony Brook University School of Dental Medicine faculty researchers Dr. David Lam and Dr. Srinivas Myneni, in collaboration with NuShores Biosciences LLC, were awarded a 2.5-year SBIR Fast-Track Grant for $1.7 million. October 2018 – Stony Brook School of Dental Medicine has received a 2.5-year Small Business Innovation Research (SBIR) Fast-Track Grant through the National Institute of Dental & Craniofacial Research (NIDCR) of the National Institutes of Health (NIH) alongside NuShores Biosciences LLC. The research grant is to study the viability of NuShores’ NuCress™ bone scaffolds in craniofacial tissues. SDM’s Dr. David Lam, MD, DDS, PhD, Professor of Surgery and Oral & Maxillofacial Surgery and Chair of the Department of Oral & Maxillofacial Surgery, and Dr. Srinivas Myneni, BDS, MS, PhD, Assistant Professor and Director of Periodontal Research, Department of Periodontology, will lead the project at Stony Brook University. Unlike existing technology, the NuCress scaffold is a nanomaterial-based bone regeneration device with tunable porosity, or the ability to be adapted to match the pore size of the existing bone. 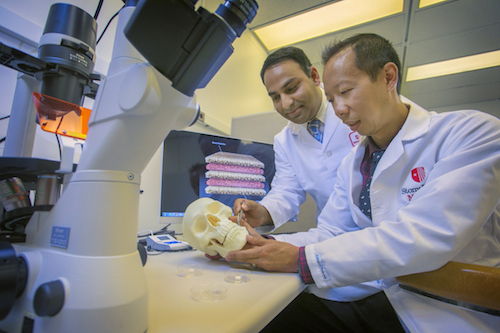 Dr. Myneni and Dr. Lam’s research into this technology has the potential to provide bone regeneration solutions for patients with issues ranging from tooth loss to devastating effects from cancer, congenital defects, infections, and craniofacial trauma. “This NIH award recognizes the profound early results of NuCress scaffold technology in long bones, and we aim to validate it as a revolutionary advancement in craniofacial bone healing and transformational technology for surgeons challenged with not only restoring form but also function in patients with craniofacial defects,” said Dr. Lam. According to Dr. Myneni, clinicians are currently faced with “issues with fixation and stabilization, insufficient bone regeneration, complications with bone harvesting, prolonged healing of up to nine months, and high costs,” when treating patients. If successful, this technology would alleviate these challenges by mirroring the mechanical, physical, and biological properties of the craniofacial bones and surrounding microenvironments. The grant allows for an exciting expansion of Stony Brook School of Dental Medicine’s research portfolio. “The collaboration between Dr. Lam, Dr. Myneni, and NuShores Biosciences launches the School of Dental Medicine into novel and vital surgical tissue engineering that has the potential to transform approaches in patient regenerative medicine,” said Dr. Mary Truhlar, Dean. "The crucial results of our preclinical studies in this Fast-Track Grant will inform future clinical trials in patients not only at Stony Brook Medicine, but around the country," said Dr. Lam. The SBIR program involves 11 federal agencies investing more than $3 billion a year in high risk/high payoff research and development conducted by the nation’s leading science-technology innovators. NuShores’ award is known as a Fast Track Grant, where funding occurs when SBIR Phase I and Phase II proposals are peer reviewed at the same time and granted in a single award. This approach expedites funding and research for the companies. Research described in this press release is supported by the National Center for Dental and Craniofacial Research of the National Institutes of Health under award number 1R44DE028213-01.